Today ONLY, Insignia™ - Slim-line Pico WVGA DLP Projector $159.99 (Retail $199.99). Bring your presentation to life with this 50-lumen Insignia Pico projector. Its compact size and cube shape facilitate easy, convenient transport for efficient business travel, and the 80-inch projected screen lets everyone clearly observe visuals. 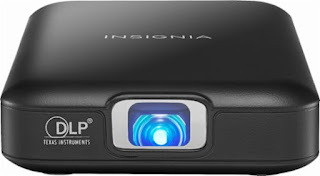 The rechargeable battery included with this Insignia Pico projector provides 100 minutes of use to accommodate longer presentations.